By Craig | October 24, 2018 | This post may contain affiliate links, which means we may receive a small commission, at no cost to you, if you make a purchase through a link. Read our Disclosure. 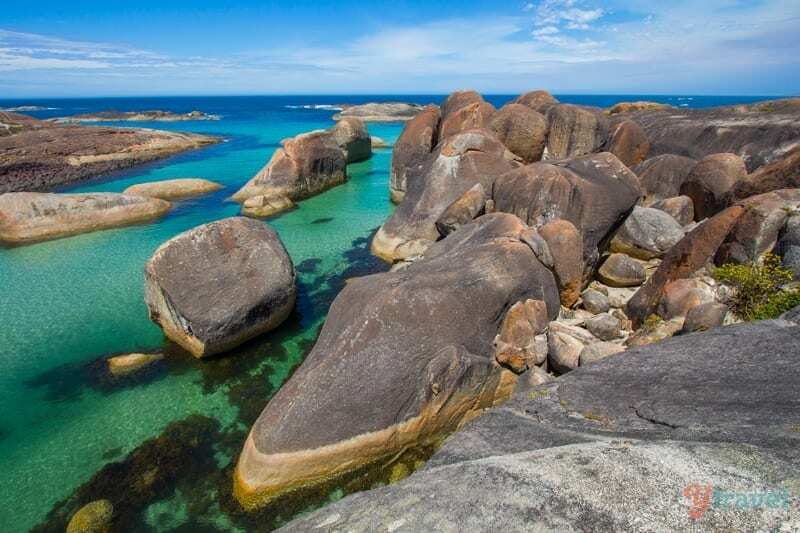 Just when we thought Western Australia’s coastline couldn’t get any more stunning, Elephant Rocks, Denmark turned it on for us. The west coast of Oz really needs to stop showing off. 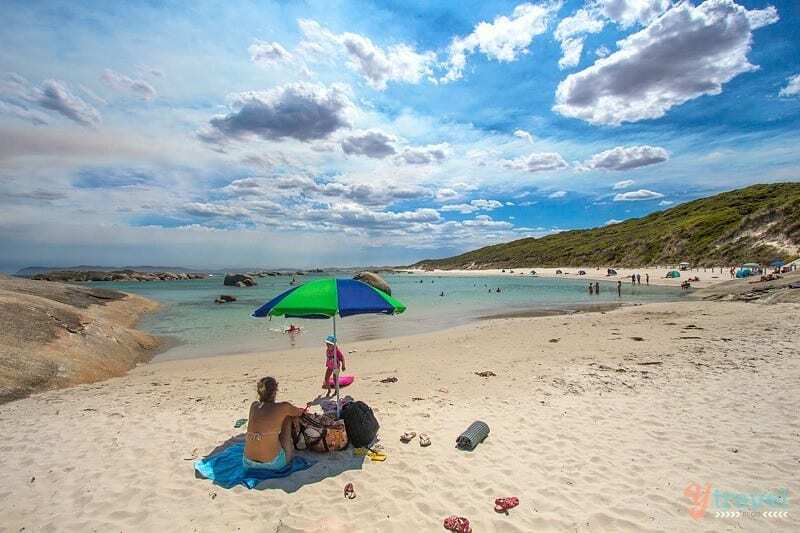 I’ve said it before and I’ll say it again, the beaches in Western Australia are probably the best we’ve seen on this trip around Australia, and this beach certainly helped back that up. 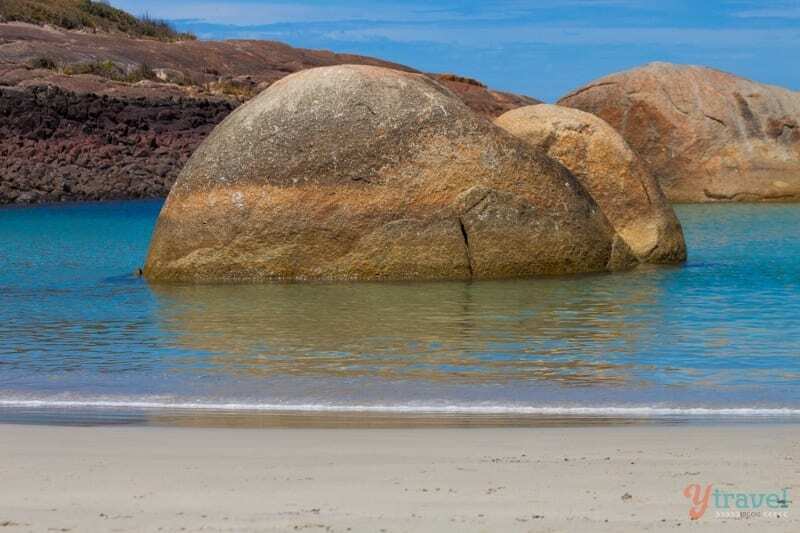 Elephant Rocks is located 15 kilometres from the town of Denmark in William Bay National Park, south-west WA, about a 4.5-hour drive from Perth. 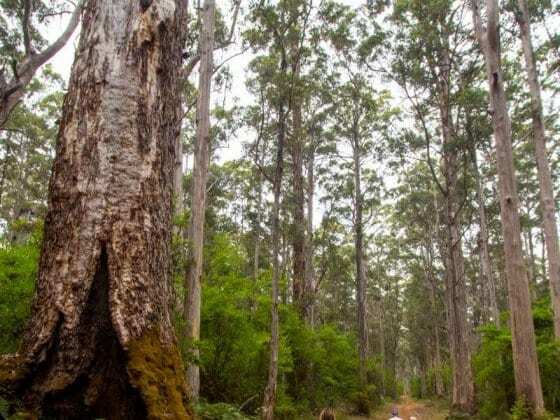 Whilst it might seem off the beaten track, it’s a must if you’re in this region of Australia. The photos below don’t lie. There’s a short walk from the carpark along a coastal track and then you are rewarded with this view out over the Great Southern Ocean. I didn’t quite get the angle of this photo right, but if you’re looking at it from a particular view point you’ll see that it’s called Elephant Rocks because it resembles a herd of elephants paddling in the shallow waters. We had fun climbing around on the top of the rocks enjoying the stunning view of Elephant Cove below, before making our way down onto the beach. Just be careful though, it’s a big drop from up here. Taking the stairs down, you then walk through a narrow gap between two towering rocks onto Elephant Cove, otherwise known as paradise! This sheltered beach is absolutely stunning. We spent all morning here and the beauty of it, like most west coast beaches, is hardly any people. 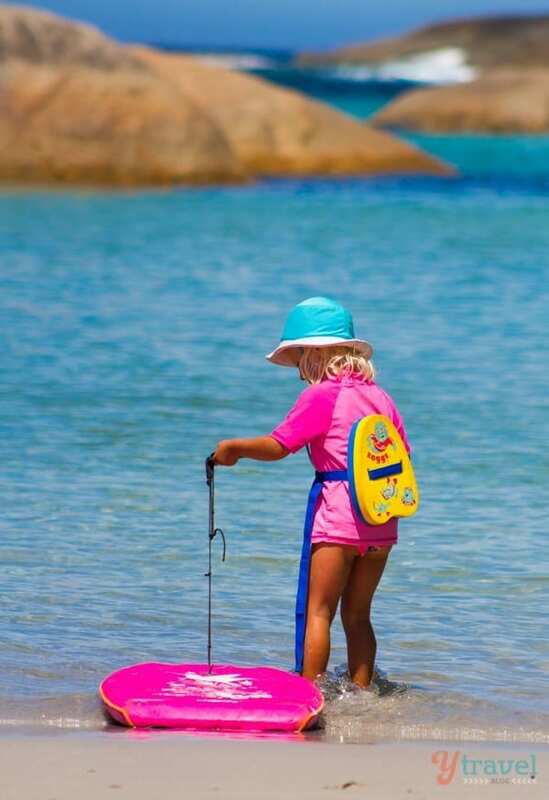 We basically had it all to ourselves to swim, paddle on our boogie boards, and relax on the sand. We forgot to bring our snorkeling equipment, bugger, but there was another dude here snorkeling and apparently it’s good. At least the water is crystal clear and shallow in most parts. 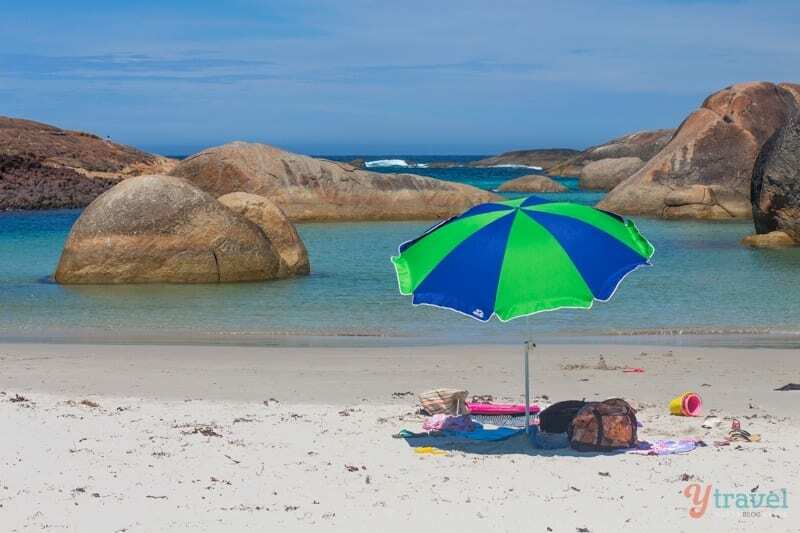 Otherwise, just bring your towel, beach umbrella, and nibbles and drinks for a beach picnic. 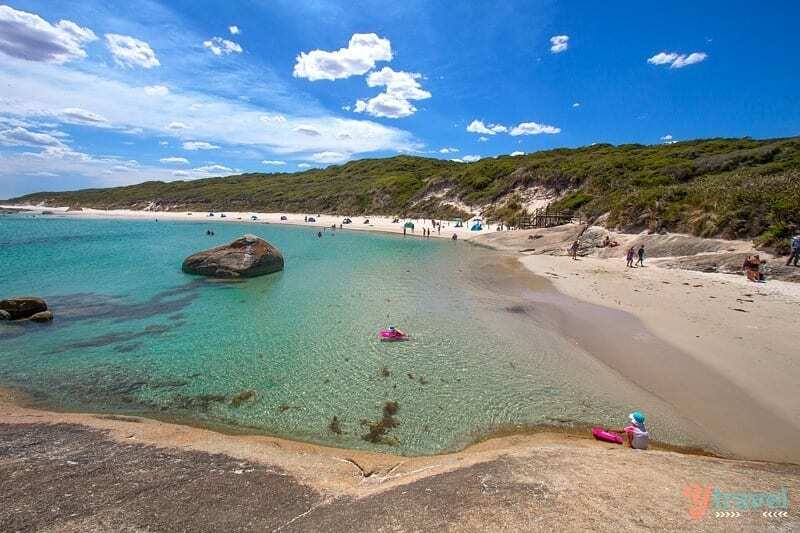 Just a few hundred metres walk from Elephant Rocks is Greens Pool, another picturesque swimming area. Not quite as pretty as Elephant Rocks I thought, but still a lovely sheltered area to swim, snorkel and relax. And to think I’d never herd of this National Park before. 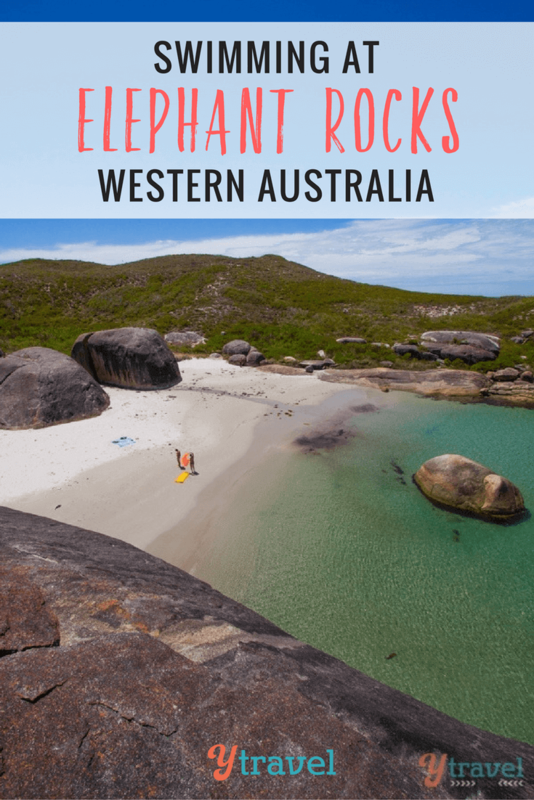 Definitely add Elephant Rocks and Greens Pool to your list for Western Australia. It’s probably best to visit with another person and be careful of any tidal surges, although both areas are pretty well protected by the large rocks. There are drop toilets here but no shops. At the very least bring some water because you will want to stay a while and have a swim. And nearby Denmark is a nice little town to explore for a day or two. I loved Elephant Rocks and Green Pools as well. Although it was too cold to swim here when we were there. Stunning photos! This is so beautiful and peaceful! I want go!!!!!! Love your pics! Done! Just added this to my list and Pinterest collection 🙂 Absolutely stunning! Wow. Australia is one of the “major” places I haven’t visited. These pictures just moved it up a bit on my list. 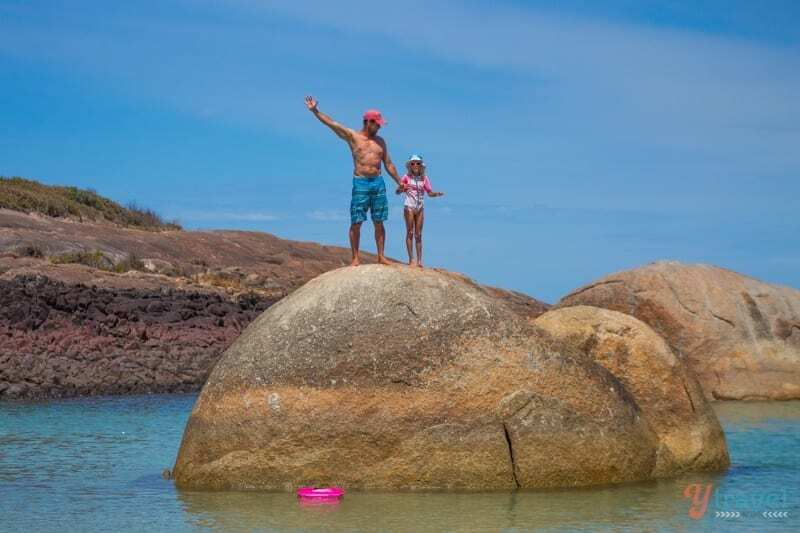 The large, rounded rocks at Elephant Rocks remind me a bit of Boulders Beach in South Africa (and those boulders are complemented by penguins!). Great post and great blog – I found it searching information about my homecountry: Denmark :-). I have shared article about your roadtrip on our Facebook page for Backpacker Planet. 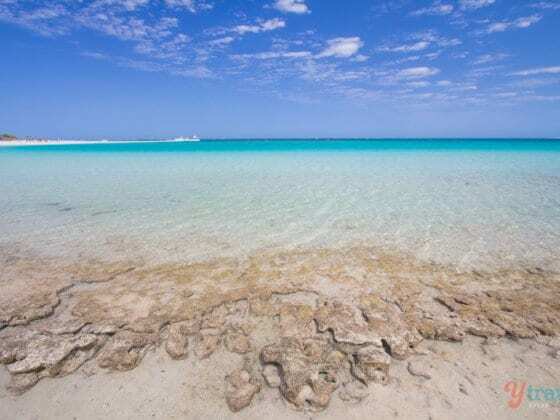 I’ve heard the west cost beaches are beautiful but these photos are something else again, not sure we’ll ever want to leave once we get around there! Love the photo’s, as usual. I’m glad you enjoyed it; it is a stunning place. 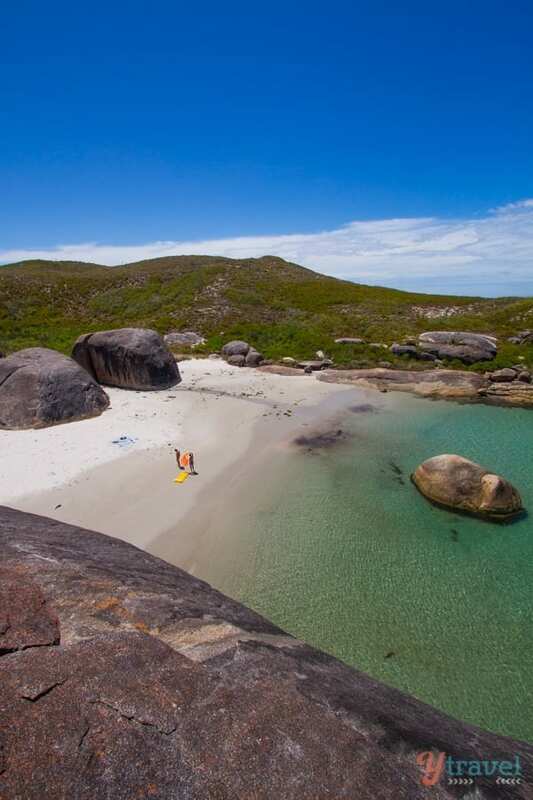 We certainly have some amazing beaches in WA! 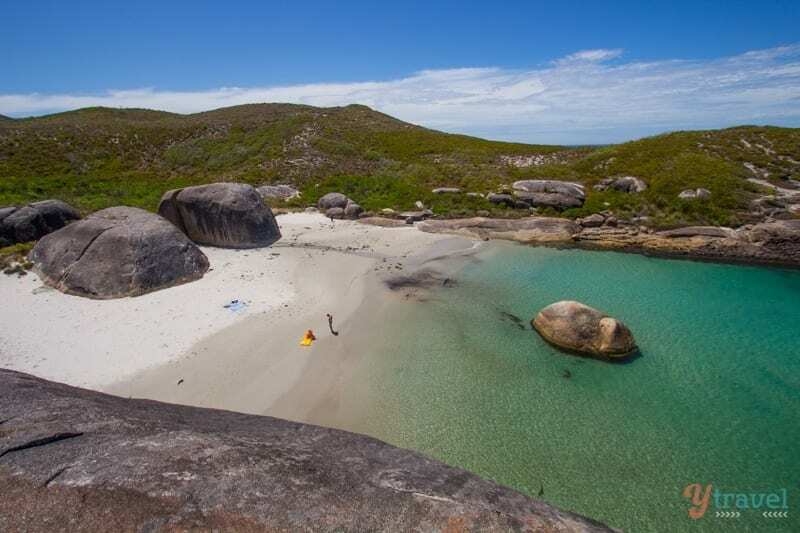 2 of my favourite beaches in WA, looks like you had the perfect day for it! I was reading this post and the “about” section. Seems you guys are travelling around Australia right now. 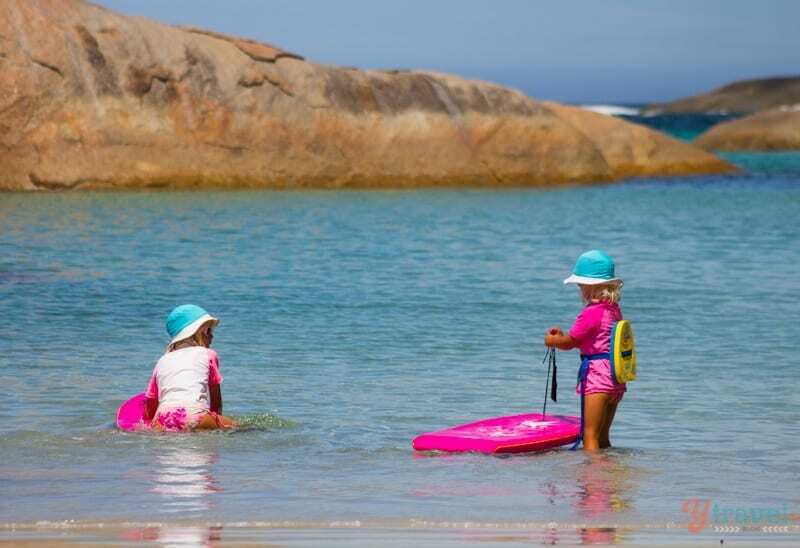 Do you have any plans to travel with your kids to another country for a prolong time? really clean beach over there.. great pics brother. keep shoot and upload. Wow! 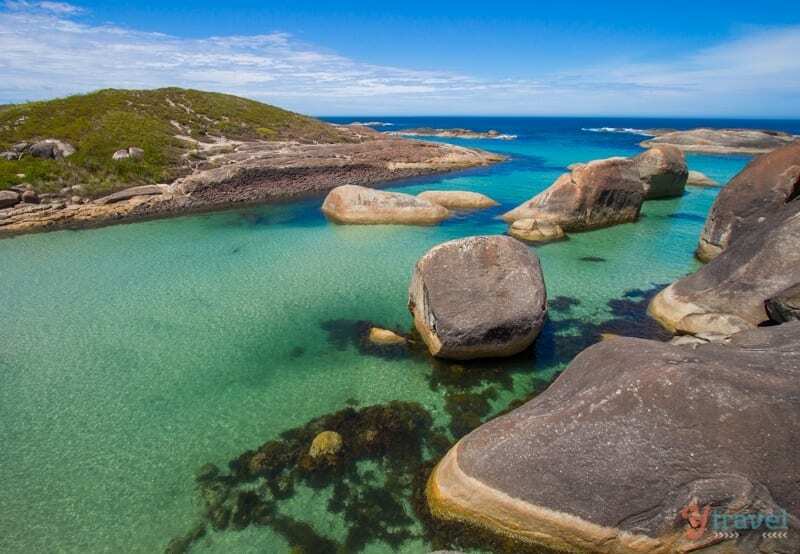 Magnificent scenery and photos, would love to visit WA and will have to add this spot to the list. Very nice pics. I can definitely see why the call them elephant rocks. 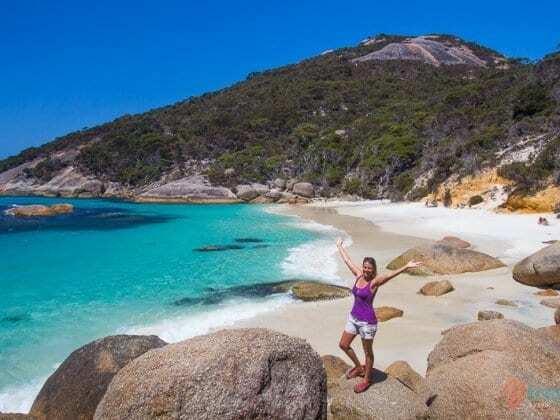 Australia is definitely on the top of our must-visit list. Wow, amazing place, the rocks are really awesome. The water are in a good temperature there ?